Scandal • The two differ over deal during secretly taped session in April at an Orem doughnut shop. 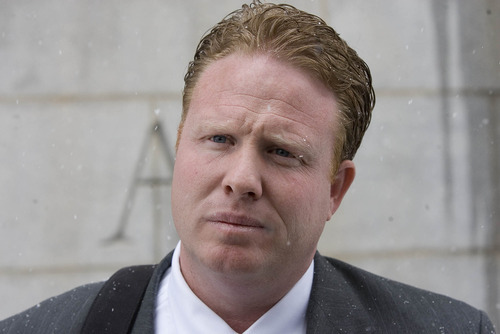 Paul Fraughton | The Salt Lake Tribune Jeremy Johnson, left, leaves the federal courthouse in Salt Lake City, Friday, January 11, 2013. You hear them on the audio: Jeremy Johnson insisting the tens of thousands of dollars he forked over were for payoffs, and John Swallow saying no, the money was for lobbying. They talk about Senate Majority Leader Harry Reid and how the powerful Nevada Democrat  for a price, according to Johnson  could be key to derailing a Federal Trade Commission probe, legalizing online poker and stalling payday-loan reforms. This back-and-forth conversation between the indicted St. George businessman and the state&apos;s future attorney general  come to life in a newly released hourlong audio file  takes place in, of all places, a Krispy Kreme doughnut shop in Orem. Johnson secretly recorded the April 30, 2012, meeting with Swallow, then Utah&apos;s chief deputy attorney general. The two huddled after Johnson had been unsuccessfully pushing Swallow for months to get money back from another party to the deal, Richard Rawle, the late owner of the Provo-based Check City payday-loan chain. The FTC sued Johnson, his I Works company, several employees and related businesses in December 2010, just days after Johnson said he thought he had paid to make the investigation, with Reid&apos;s help, go away. Reid&apos;s office, in its strongest rebuke to date of Johnson&apos;s claim, denied the senator had part in any deals. "The allegations of bribery by Mr. Johnson, a man with a background of fraud, deception and corruption, are absurd and utterly false," spokeswoman Kristen Orthman wrote in an email. "Bribery is a crime for which Senator Reid has personally put people behind bars. Senator Reid will not have his integrity questioned by a man of Mr. Johnson&apos;s low record and character, and his outrageous allegations will not go unanswered. Clearly, a desperate man is making things up." In reply, Johnson said, "I have said nothing more about Senator Reid than what was told to me by Mr. Swallow. I would welcome the opportunity to further hear from Mr. Reid of just what my &apos;background of fraud, deception, and corruption&apos; is." And, Johnson added in an email, "If I have said anything about Senator Reid that is untrue, I would invite the Senator to call me out on it." Swallow also denied any wrongdoing and said Monday that the recording backs his earlier claims that he was minimally involved and that the deal was only to hire lobbyists. "The release of this recording confirms everything I&apos;ve said about this from the beginning," Swallow said in a statement. "I did not do anything illegal and I encourage Mr. Johnson to fully cooperate with the ongoing investigation." In the audio, Swallow defends the deal, which he characterizes as hiring lobbying firms to help Johnson. But Johnson maintains that Swallow knows what the object was  to get money to Reid or an associate to scuttle the FTC investigation. Johnson says he believes that could be done because he had been told Reid had done so before. Then Johnson tells Swallow about an early 2010 meeting he attended in Las Vegas between Reid and representatives of the online-poker industry. At the time, Johnson co-owned a company that was processing online-poker payments through SunFirst Bank in St. George. Reid  a longtime ally of Nevada&apos;s gaming industry  told those at the meeting he was reversing his position and would introduce a bill to legalize online poker. Johnson claims he then asked an unnamed person associated with Full Tilt Poker why Reid would do an about-face. "I said, &apos;How in the hell did you guys get him to do that?&apos; And he said, &apos;Let&apos;s just say he got a little something in his retirement fund,&apos; " according to the audio, with Johnson then mentioning an untraceable $1 million check he was asked to withdraw from the poker funds at SunFirst and send to some entity. John F. Baughman, an attorney for Ray Bitar, the former owner of Full Tilt Poker, said Monday he could not comment because his client still faces a poker-related criminal case in New York. In the audio, Johnson also says that Rawle bragged about using Reid to stall payday-loan reforms that were pushed by then-presidential candidate Barack Obama in 2008. During their meeting, Johnson and Swallow also discuss previous emails and exchanges they had about the legality of processing online-poker payments from Utah. But the bulk of the conversation centers on the purpose of the FTC deal involving Swallow, Johnson and Rawle. "I think you may have the wrong idea," Swallow tells Johnson at one point, but adds, "I don&apos;t know what the arrangement is, but I think  I think that they have lobbyists they pay on retainer." Statements from Swallow and an attorney for the Rawle family and Check City have shown that Johnson&apos;s I Works paid $250,000 to a Rawle company called RMR Consulting LLC. From there, $50,000 went to a Washington, D.C., lobbying firm and $50,000 to a Las Vegas law firm, which is associated with a longtime Reid friend and business partner. Johnson, during the meeting, badgers Swallow about RMR Consulting and whether Swallow received money from them, apparently as part of the deal. Toward the end of the conversation, Swallow says he received two payments but tells Johnson they were for consulting on a proposed cement plant in Nevada. A deathbed statement from Rawle, who succumbed to cancer Dec. 8, also denies any bribery attempt and says the payments to Swallow  totaling $23,500  were for consulting on the plant, though he does say the money came from a fee he kept as part of the Johnson deal. Swallow insists during the meeting he did nothing wrong "criminally," but "politically  politically," he adds, "I go whoa." The audio was released after Johnson said Monday morning he would consent to make it public, along with other materials, if Swallow agreed. Swallow, through spokesman Paul Murphy, did not object. Johnson balked Monday evening, however, saying he was upset that the audio was coming out. "I have refused to give that to anyone," Johnson said in a text message, "and I am upset that someone who had access to it released it without my permission." "The allegations of bribery by Mr. Johnson, a man with a background of fraud, deception and corruption, are absurd and utterly false. Bribery is a crime for which Senator Reid has personally put people behind bars. Senator Reid will not have his integrity questioned by a man of Mr. Johnson&apos;s low record and character, and his outrageous allegations will not go unanswered. Clearly, a desperate man is making things up." "Mr. Reid is arguably one of the most powerful people in the world. I am interested to know who he has &apos;personally put behind bars&apos; and if this is some thinly veiled threat to me. I have said nothing more about Senator Reid than what was told to me by Mr. Swallow. I would welcome the opportunity to further hear from Mr. Reid of just what my "background of fraud, deception, and corruption" is. In this country a person is not guilty of a crime until a jury finds him guilty. Mr. Reid and our current government do not believe in this principle, and are doing everything in their power to erode the most basic and sacred rights guaranteed by our Constitution. They believe if a defendant refuses to settle and agree with the government&apos;s allegations, then they should seize and sell their assets, deny them the use of their money for an attorney, arrest their friends and family, and do everything in their power to deny them a trial by jury. The government has spent millions of dollars and has teams of attorneys doing everything they can to prevent me from my day in court. This has been going on for over two years now, and there is no end in sight. It&apos;s easy to point the finger at a guy like me when you have the money, power, and resources of the federal government at your fingertips. I will remind Mr. Reid that he lives in a glass house that is filled with shady real estate deals, secret meetings, and questionable fund raisers. He should be careful where he throws rocks. The American people are not fools, we all know the good senator did not become a multi-millionaire by being a "public servant" as he likes to call himself. If I have said anything about Senator Reid that is untrue, I would invite the senator to call me out on it. I have nothing to gain from any of this and the senator has everything to lose. I assume that is why he has to make inflammatory and unsubstantiated statements against me in a desperate effort to deflect attention from his own misdeeds. Once again, it&apos;s an easy sell when all he needs to do is point his finger at the guy his government has accused of wrongdoing. However there is a reason that they can&apos;t seem to scrape up the evidence for a trial after over two years of trying. God, help us all if people like this are allowed to decide our fates. &apos;Senator Reid will not have his integrity questioned by a man of Mr. Johnson&apos;s low record and character.&apos; Mr. Senator, the American people question your integrity, not me. If you would like to sit down and compare our records and character, I would welcome that opportunity. My life is an open book, and we all want to see what is in yours, so just tell me the time and place and I will be there."